The 33-year-old took more than a minute off the previous best which was set by compatriot Dennis Kimetto when heran 2:02:57 in Berlin in 2014.“I lack words to describe this day,” saidKipchoge. 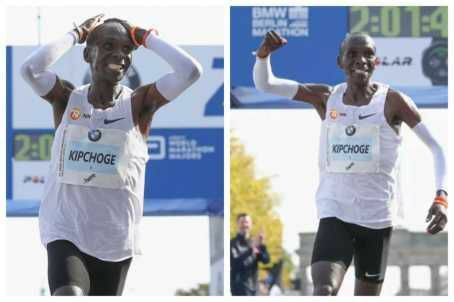 “I am really grateful, happy to smash the world record.”Berlin Marathon had initially given his unofficial time as 2 hours, 1 minute and 40 seconds, then adjusted it by one second.“The winning time is now official and another second faster: 2:01:39 for Eliud Kipchoge!” it said. In June, Kipchoge said his focus was on winning the Berlin Marathon.“My preparation is entirely concentrated on the BMW Berlin Marathon on September 16,” he said. “I am confident I can beat my personal best on this fast course if conditions are good.”The women’s race was won by Gladys Cherono of Kenya in 2:18:11. Kipchoge is regarded as one of the greatest marathon runners of all time. He won the London Marathon for a third time earlier this year and is the Olympic champion over the distance.“It was hard,” Kipchogeadded. “I ran my own race, I trusted my trainers, my programme and my coach. That’s what pushed me in the last kilometres.”In 2017, Kipchoge missed out on becoming the first athlete to run under two hours for the marathon by 26 seconds. The Kenyan clocked 2:00.25 but because in-out pacemakers were used, the time was not be recognised as a world record.